MusicWeb uses .inc (includes) files to deliver information into webpages. These can be interfered with by protective devices such as Zone Alarm and also Spy-ware and Ad-aware programmes may prevent you seeing these. As an example if you use Zone Alarm just ticking the following is not enough. 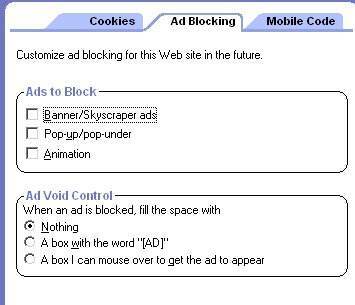 You need to select MusicWeb and hit the Options button (bottom right) and select Ad Blocking. Remove all the crosses from the boxes to allow pop-ups and banners. This will be specific for MusicWeb. You will need to repeat for any other trusted site.